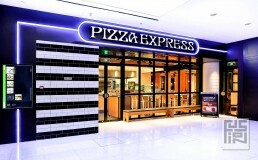 Working on our first project in the far east for Pizza Express was an exciting challenge and involved working across two time zones, and required a lot of coordination between the teams in both the UK and China. 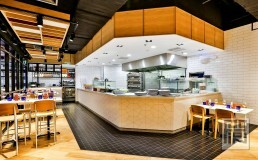 Our brief was to provide a new Pizza Express venue in the Raffles Shopping Centre Beijing that would stand out amongst a number of competitors. The design needed to incorporate bespoke elements inspired by the restaurants locality, whilst including key elements of the Pizza Express brand identity such as Carrara marble tables, track lighting, and an open theatre kitchen space. 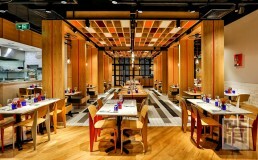 The design was influenced by elements such as the architecture and transport of Beijing, traditional and more modern methods including the Beijing bike and automotive vehicles such as cars and trains were all looked at in order to prepare the design of the restaurant and to provide the space with key features with real impact. The use of these strong colours amongst the softer natural oak and more neutral tones in the restaurant provide the space with a real sense of energy and visual excitement.